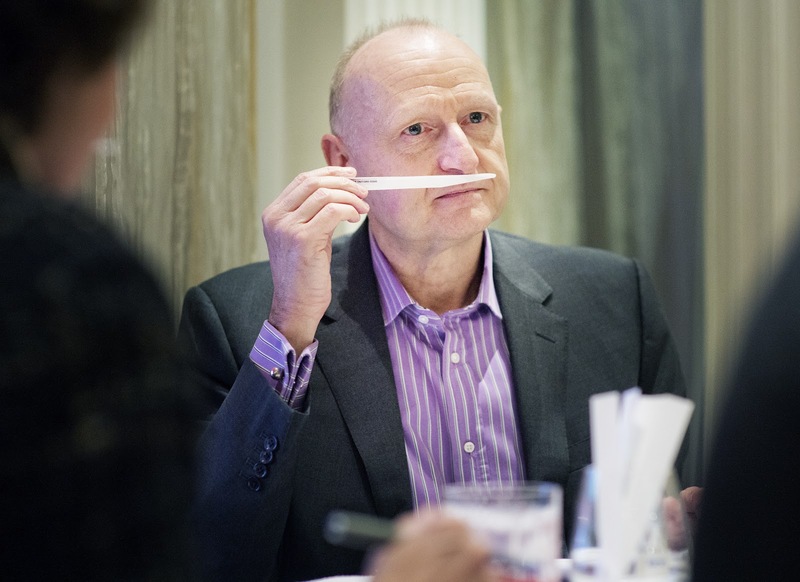 Grain de musc: Fifty Shades of Grey, the perfume, at IFF's Speed-Smelling Lunch! 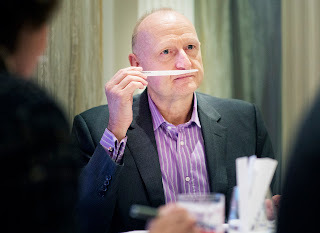 Fifty Shades of Grey, the perfume, at IFF's Speed-Smelling Lunch! If you were a perfumer reading Fifty Shades of Grey, of course you’d start wondering what the apparently aphrodisiac combination of “Christian and shower gel” smells like. From then on, of course you’d set about jotting down a formula. That’s exactly what Sophie Labbé did. The author of Bulgari Jasmin Noir, Guerlain Cologne du 68, Givenchy Organza and Very Irrésistible couldn’t resist distilling the essence of Christian Grey as part of the annual, free-style exercise IFF affords its perfumers. IFF’s Speed-Smelling presentation and lunch is one of the few events beauty editors actually arrive ahead of time to attend. We’ve got one hour to flit from one table to another. At each stop, perfumers present a fragrance they’ve drawn from their personal inspiration, with no limitations on style or budget. A great opportunity for them to play with IFF’s luxury ingredients (mostly naturals produced by Laboratoires Monique Rémy), and to have a chat with specialized journalists they normally meet at launches, where they might not be able to discuss their work as openly. 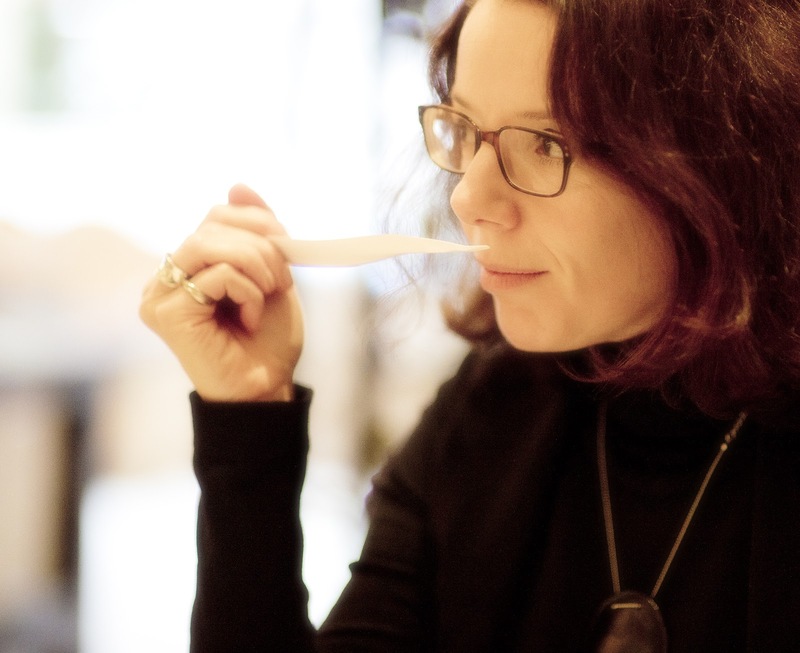 Sophie Labbé conceives the smell of Christian Grey as an ultra-niche shower gel. Aldehydes for the bubbles, musks for the white linen shirt, jasmine, cumin and nutmeg for a subtle human touch. Karanal, which spans from “clean laundry” (it is used in detergents) to animalic (it is an ambergris note), gives the scent the slight abrasiveness of crisp linen. Oddly enough, this scent really is somewhat in shades of gray: though it has quite a powerful sillage, it doesn’t quite register as perfume but rather as a stealthy aura. I carried the vial with me the next evening at the party of the French publishers of Fifty Shades, where of course it was greeted with squeals of glee. I’ve even had to promise a best-selling author – one of the stars of the French Elle – I’d get some made up for her. She was ready to buy it immediately! I’d wager even people who’d turn their noses up at the book could embrace this scent. 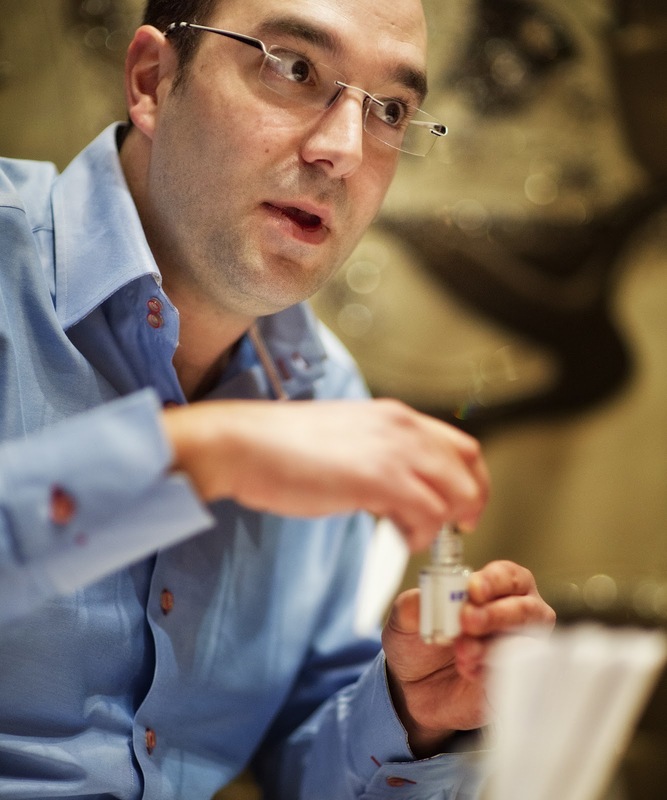 Ropion is renowned for studying the analyses carried out by IFF’s scientists so he can tease out and highlight molecules present in natural materials. He tells us, surprisingly, that oud shares some components with pineapple and white wines. And since his idea is to work on oud as though it were a normal ingredient in the perfumer’s palette rather than a cornerstone of French-Oriental compositions, he’s boosted those notes into an improbable oud-champagne accord topped with an extravagantly realistic, tchika-boom-ay-ay-ay pineapple. It’s got a boozy edge, as though it were starting to ferment (I’ve once had a pineapple literally explode in my kitchen because of fermentation, and that’s pretty much the effect here). Its tartness runs gives way to a powdery, subtly animalic floral heart (cassie, mimosa and iris) resting on a leather-oud base, which contains 2% oud and 1% castoreum (my unerring “spiky-woods” detector reads an ambery-woody synthetic). With its exploding pineapple, “Champagne oud” is as wacky in its way as Géranium pour Monsieur, and the proof that alongside his high-precision approach, Dominique Ropion also has an off-beat sense of humor. A flower… white, but not what perfumery labels as a “white flower”. Familiar. Yes, you’ve always known it… Aliénor Massenet nods. White lilac, she says. She composed the scent for a group of outpatients of the Garches hospital, TBI sufferers she meets every month, equipped with a set of scents, as a volunteer of a program initiated by Cosmetic Executive Women France in thirteen French hospitals. Lilac is what is called a “mute” flower since its essence can’t be extracted; it is also a flower condemned to the limbo of functional fragrance. Somehow, it seems like poetic justice that Aliénor’s lush, tender reconstitution of its scent would nudge patients with impaired memories into recovering whiffs of their personal history… Her lilac is also, in and of itself, a lovely perfume that could well rehabilitate this well-loved flower. Few fragrances actually focus on the scent of the iris flower (I can only think of Iris Ukiyoé), though some varieties are fragrant. Inspired both by the blossom’s fragrance and Georgia O’Keefe’s Jack in the Pulpit n°IV, Nicolas Beaulieu (no relation) based his rendition of a purple iris,on a particular type of iris resinoid that gives off a distinct dark chocolate facet. Since the flower he studied also gives off a tender orange blossom scent along with a touch of aqueous green, he wrapped his accord with orange blossom and violet leaf. His purple iris is as velvety-moist as a purple iris petal, strikingly vegetal and subtle. “I’ve worked on addiction”, Domitille states with a sly smile before adding that actually, what she’s hooked on are nuts. Hazelnuts, walnuts, chestnuts, almonds… The result is a grown-up, resolutely non-sweet gourmand drizzled with sesame absolute, maté and patchouli. Smoky, roasted, warm, this scent feels addictive of its own accord, rather than because it conjures a bowl of mixed nuts. Coffee. Cocoa. Cinnamon and vanilla. The bracing aromatic flavor of aquavit conjured through sage, lavandin and anise… Véronique, who spends her winter holidays in the south of Sweden, wanted to render the warm aromas of a wooden house tucked under a blanket of snow, with the foods and drinks served around Christmas. The myrrh, anise and roasted notes provide a licorice effect that strengthens the woody base notes. With its aromatic accents and resinous undertones, this would make a great masculine. To be continued with Jean-Christophe Hérault’s Princess and the Pea, Olivier Polge’s sandalwood, Anne Flipo’s fruity tuberose, Loc Dong’s ink and Juliette Karagueuzoglou’s orange blossom… and a thrilling surprise! If you missed the posts on last’s year edition of IFF’s Speed-Smelling lunch, please click here, and again here. The nutty one and the Swedish Christmas sound fabulous! Thanks- and a good amount of envy for the Ducasse lunch! Iodine, all the scents were really interesting... and, yes, I didn't go into too many details about the Ducasse lunch. Let's just say it involved truffles! The whole experience sounds fascinating!!!! It would be great, though I understand impossible, if these personal essays of top perfumers were sold in a coffret, in sample size, by IFF. I join iodine in envying your lunch. Zazie, I was kind of keeping the news for part 2 of this post, but actually... it *will* be possible to experience these scents. They will be sold to the public in a limited-edition coffret next spring! While I'd love to try nearly all of those (I'll pass on Christian Grey, thank you) I must say that Ropion's formula sounds amazing. Patuxxa, whatever you think of the book, Sophie Labbé's composition is very good... Dominique Ropion's "champagne oud" is really surprising indeed. I think the pineapple is a bit too much in the first couple of minutes, but after that it's a much smoother ride. Mikael, by the time they'd made the announcement, champagne had been consumed, but I'm certain I heard it would be sold online though no details were given about export policies. There will be only 250 though, that I remember for sure. The white lilac and swedish Christmas are the most intriguing to me. Thank you for posting this! You have the most incredible life! i ddn't really like 50 Shades. It irritated me. I wanted the girl (can't eben remember her name-that's not good) to just pursue her education. God, I am lame! Tara, no price was mentioned... I'm sure there will be splits though.